Henry (Harry) Robert Wilson was born on 30 June 1893 at Black Flat, Victoria (near present-day Glen Waverley), the son of Robert and Mary Ellen (Begg) Wilson. On 3 September 1919 at St Kilda, he married Doris Jean Margaret Smiley, daughter of Thomas Alexander Ward and Marion Harley (Bunn) Smiley. 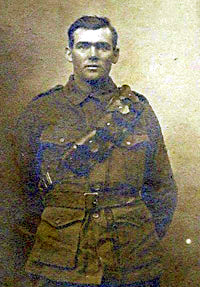 Prior to that marriage, on 1 December 1915 when he was aged 22, Harry Wilson enlisted in the Australian Imperial Force and was assigned to the 24th Battalion, 8th Reinforcement Unit. He embarked in the troopship HMAT Afric in Melbourne on 5 January 1916 and then spent 1,503 days away from Australia, returning on 15 May 1919. After failing twice at my attempts to enlist due to my chest measurements being only 32 inches, they then reduced the limit to 32 ins and the height limit to 5 foot 2 inches. The biggest number of enlistments in any one day was early in 1915 when 22,000 went through. I went to the Seymour camp but was a cot case in the first two weeks and was sent to the Base Hospital in the old police barracks in St Kilda Road. They said I had meningitis but after treating me they found I only had pneumonia. After three months I sailed on the old Afric for Egypt, on 5th January 1916. We were in Egypt for about eight weeks at Tel-el-Kebir where we marched to Ferry Post. Three days carrying packs weighing 69 pounds. They all said that I'd never get there with my whip-stick legs. I got there when a lot had fallen out. We sailed for France in early June on the Kallaiym for Marseilles and we were there for three days before travelling by train to Abbeville. Our limbers had gone on ahead and when we got there our horses had been yoked up to the limbers and these horses were to stay with us. We left Abbeville on a three-day trip to the front line and on 19th July (1916) we were cut to pieces with 5,533 casualties in two hours and we got nowhere. We stayed in the area for about 4 months then took another train trip to Albert on the Somme. We went to Fricourt where there were rows and rows of horse troughs. 66,000 horses were watered twice a day. Talk about mud, we had it, and it drizzled for three weeks, not a stitch of dry clothing. Our Advance HQ was at Montauban and it was about 4 kms from there to the frontline. We left the Somme on a rush trip up to Ypres to help the Tommies as they were having a bad time. More mud. We were at Belgium Battery Corner camped about 7 kms behind the lines for about 12 months. It was terrible to get around Hellfire Corner and every day there were a lot of casualties. Then we went up a duckboard track to Zonnebeke daily with ammunition for the troops. Anything that was mucked was just rolled into the mud on a 3 km stretch. We had to use pack saddles for everything at Zonnebeke. One day we had 83 casualties out of a Company of 127 men, all of us drivers. We had our packs ready to go into the front line but reinforcements arrived. That was the only time that I can remember being called out. At Kemmell we had a marvellous time, there being very little fighting, a home away from home. Then Fritz broke through and we were rushed back to the Somme in a big hurry. It was a very dark night and no lights allowed. We landed at Corbie just about daybreak and the town people had left their breakfast on the tables and had got out with what they could carry on wheel barrows and in small carts of all sorts. We got there just in time. We placed four guns over the Somme river and were told they were not to fall in or be lost. We then had to get out. We were told to put the machine guns on the limber to cover our retreat. Fritz never took Corbie although some of his Light Horse got there. They soon retreated when they met the Aussies. Corbie was our home for a long time. Fritz tried to take Villers Brettoneux and was marching towards Corbie. Our Company, the 5th MGC, put two guns on a sunken road (cutting) and when Fritz came to the two guns he threw his guns down and surrendered. We had two guns at the back of him by that time. You have never seen such a lot of happy faces when they were taken prisoner. In all they took nearly 2,000 prisoners that day. They were camped between Corbie and Amiens for months until 8th August when they were all moved back as we had a lot of artillery coming up. If Fritz could have attacked on 4th August he'd have got all the artillery as there was the 18th Regiment and the other artillery. They were all up in the front line to move up as they broke through. I've never seen so many Rolls Royces in my life as all the armoured cars had RR engines, and as soon as the line was broken they took off. You should have seen the slaughter they caused for miles. We had to get food and ammunition to our guns and it was a big job to keep up as they were going so fast. We were halted for a couple of days near Peronne and Fritz came over in planes. The British were bringing them down just as fast as the searchlights could pick them. The bridge over the Somme had been blown up and they only had a temporary bridge and we were half way over when four of his Gotha aircraft appeared. Our AA fire turned him back and we were all relieved. I had made up my mind to go straight into the river to get away. I saw Baron Richthofen, the famous German ace, shot down. He came over to get three "Sausage balloons". He came out of the sun to get the first one and was onto the second before anyone knew. The three spotters saw him coming and bailed out. After shooting down the third one he tried to shoot the parachutists and that was his downfall. All the troops were having a shot at him - my own brother had two shots at him. He was down fairly low by that time and we all knew that he was hit. He just got over the house tops at Lahoussoye and he came down at a place called Vaux, nearly back to the German lines. We could see all his victims painted on the side of his aircraft. At Head Hill, BEF, the aircrew of a fighter wanted to go up but the officer in charge said "No. You would be committing suicide". After Peronne we were going so fast we didn't know where we were 'till we got near the Hindenburg Line. We put our guns on pack saddles and went through his trenches. When the Hindenburg Line was being taken, one of our gunners was blazing away at Fritz and his gun was tipped into the trench that was about 12 feet wide and 7 feet deep. Two gunners named Murkitt and Box picked the gun up and started blazing away as if nothing had happened. That was the end of the war for me as we came out of the line for a spell and when we got back to a place called Course we were all sent on leave to Blighty. I went to Belfast and was there when the Armistice was signed. They had told us that the Armistice was to be signed at 12 o'clock that day, and did we have three days of pleasure. They wouldn't let us pay for anything. All buckshee. I stayed an extra day, and by the time I got back to Horseferry Lane my mate from Australia was there on his way to France. We had two lovely weeks together as his unit, 3rd Div, was sent up to a place called Bossigny. I never saw him again until we landed in Australia. We were away about the same time and we were supposed to come home as we left, and he left about three months after me. I was very hostile about him getting home before me so I was paraded before General Freyberg VC, a New Zealander, and he told me that we would catch up to them and be first home. We came home in the Orontes and we landed in Melbourne in 28 days after coming around the South African coast. We were all happy when we landed home on the same day in Melbourne. On the way home we couldn't believe that the war was over. We just thought that we were shifting to another front as we did so often in the days gone by. I had been away for 1,503 days. Return to information about Harry and Doris (Smiley) Wilson.